the first communication revolution in the United States. The First Transcontinental Railroad in North America was built in the 1860s, linking the well developed railway network of the East coast with rapidly growing California. The main line was officially completed on May 10, 1869. The vast number of people who traveled the line, and the complex web of connecting routes that followed, set the USA on the path to economic abundance. It also ended the centuries old way of life of the Native Americans and greatly altered the environment. The rail line was an important goal of President Abraham Lincoln, fostered during the early portion of his term and completed four years after his death. 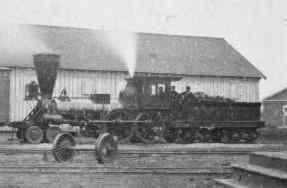 The building of the railroad was motivated in part to bind California to the Union during the American Civil War. The TCRR is considered by some to be the greatest technological feat of the 19th century. The transcontinental railroad replaced the slower and more dangerous wagon trains, Pony Express and stagecoach lines that crossed the country by land and the equally difficult sea journey around the southern tip of South America. The route largely followed the well established Oregon, Mormon and California Trails. The new line began in Omaha, Nebraska, followed the Platte River, crossed the Rocky Mountains at South Pass in Wyoming and then through northern Utah and Nevada before crossing the Sierras to Sacramento, California. The Central Pacific laid 690 miles (1,110 km) of track, starting in Sacramento, and the Union Pacific laid 1,087 miles (1,749 km) of track, starting in Omaha. The two lines connected at Promontory Summit, Utah. Talk of a transcontinental railroad started in 1830, shortly after railroads began large scale operation in the United States. At about the same time English-speaking settlers began settling in Mexican controlled California. In June 1845 Asa Whitney led a team along the proposed central route to assess its capabilities. Whitney then traveled widely to solicit support for the rail line, printed maps and pamphlets, and submitted several proposals to Congress. Legislation to begin construction of the Pacific Railroad via the central route was introduced in Congress but not acted on. California became a U.S. territory in 1848 with the Treaty of Guadalupe Hidalgo which ended the Mexican-American War. The very same year saw the beginnings of the California Gold Rush (better known in 1849) which brought great numbers of people west, many of whom stayed. California became increasingly an important part of the United States and the idea of a rail connection to it gained support. Concerns lingered that snow would make the central route impractical. A survey indicated that the best southern path ran through territory still held by Mexico. Therefore in 1853, only five years after taking California by force, the United States made the Gadsden Purchase from Mexico, acquiring the southern portions of what is now New Mexico and Arizona. This placed the southern transcontinental route entirely within the U.S. 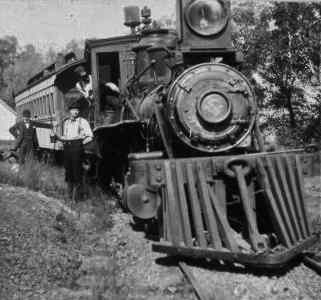 However, despite approving the Purchase, Congress did not fund construction of a rail line at that time. The southern route was completed in 1881, giving it the dubious distinction of being America's second transcontinental railroad. The route is generally followed by Interstate 10 today. In early 1861, Theodore Judah, a rail construction engineer and Daniel Strong, a local miner, surveyed what became the western portion of the route. They proposed a rail line in the Sierra Nevada mountains through Clipper Gap, Emigrant Gap, and Donner Pass, then south to Truckee. Collis Huntington was inspired by a Theodore Judah lecture on the possibilities of a railroad. Huntington found four partners who initially invested $1,500 each. The partners included Leland Stanford, a grocer, the future governor of California, and founder of what became Stanford University. These investors became known as the Big Four and their venture was called the Central Pacific Railroad. The fabled Pony Express, which provided mail service from the East to California, only operated in 1860 and 1861. In that short time the riders learned that the central route was usable despite the winter snows. With the weather worries cleared away and Texas joining the Confederacy, the central route, always the more favorable economically, became the chosen route. The House of Representatives voted for the line on May 6, 1862, and the Senate on June 20. Lincoln signed it into law on July 1. Two companies were hired -- the Central Pacific would build from the west and the Union Pacific from the east. 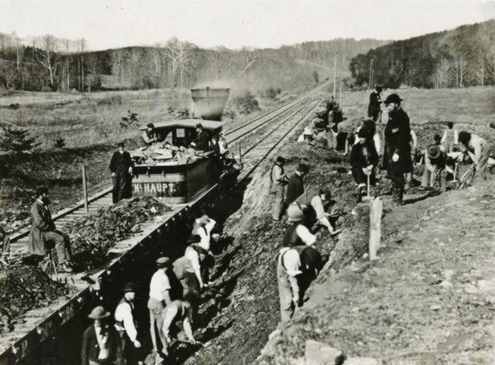 Besides land grants along the right-of-way, each railroad was paid $16,000 per mile ($9,940/km) that was built over an easy grade, $32,000 per mile ($19,880/km) in the high plains, and $48,000 per mile ($29,830/km) in the mountains. These terms encouraged the companies to construct many extra miles of track, direct the line toward property they owned, and in many other ways exploit the poorly written law to their benefit. Route of the first Transcontinental Railroad. 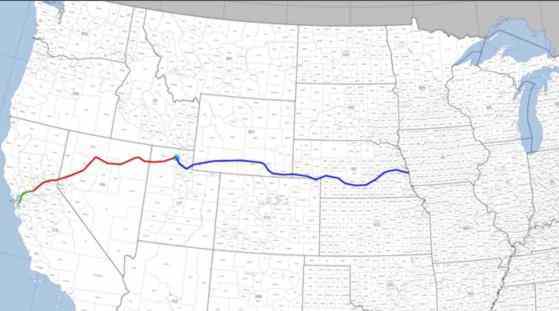 and the Union Pacific (blue) laid track from Omaha. Once it was decided that the railroad would follow the central route, there was general agreement that the western terminus would be Sacramento. However, there was considerable competition for the eastern terminus. Abraham Lincoln selected Council Bluffs, near Omaha, Nebraska, although the closest rail line was 150 miles east. Lincoln had visited the site in 1859 while working for Thomas Durant as a private attorney. Durant was a central figure in the TCRR. The majority of the Union Pacific track heading westward was built by Irish laborers, by Mormons who constructed much of the track in Utah, and after the war by veterans of the Union and Confederate armies. Chinese immigrants did most of the work on the Central Pacific track. Most White men received between one and three dollars per day, but workers from China received less and were supervised by Whites. Eventually, the Chinese went on strike and gained a small increase in salary. Track laying employed a quarter of the labor force. The operation also required a great number of blacksmiths, carpenters, engineers, masons, surveyors, teamsters, and cooks. Telegraph lines were built following the tracks, bringing near-instant communication. Rail work in the 1860's was hand work. but see the guy on the left sitting in a chair. On January 8, 1863, Leland Stanford, now governor, officially broke ground in Sacramento to begin construction of the Central Pacific Railroad. The Central Pacific made quick progress along the Sacramento Valley. However construction soon slowed, first by the Sierra Nevada mountains and then by winter snowstorms. The mountains required tunneling, a slow, expensive, and dangerous process. Holes about 3/4 inch (2 cm) diameter were pounded five feet into the rock face by hammer and chisel, a single hole was a day's work for two men. The holes were then filled with black powder explosive. The workers developed a method, perhaps based on Chinese technique, of placing explosives on the side of cliffs while working from large suspended baskets. The baskets were then rapidly pulled to safety after the fuses were lit. The Central Pacific built 15 tunnels over the course of the construction, the longest was called the Summit with a length of 1659 feet (about 1/2 km). The enabling legislation for the Union Pacific required that no partner was to own more than 10 percent of the company's stock. However, the major investor was Thomas Clark Durant, President Lincoln's former employer, who made his money smuggling Confederate cotton during the war. 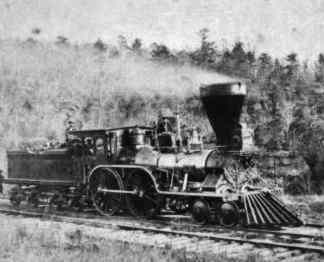 Durant used proxies to control about half the stock of the railroad. The law provided payment by the mile, so the railroad built many miles of track rambling around the countryside, mostly on land Durant owned, never venturing further than 40 miles from Omaha. Durant played this game for 2 1/2 years. With the end of the Civil War came increased government supervision. The Union Pacific began laying track west. Construction was handed to another company controlled by Durant, Crédit Mobilier. was also responsible for the railroad that destroyed much of Native American culture. Westward construction proceeded very quickly over the open terrain of the Great Plains. Soon, however, they entered Indian-held lands. 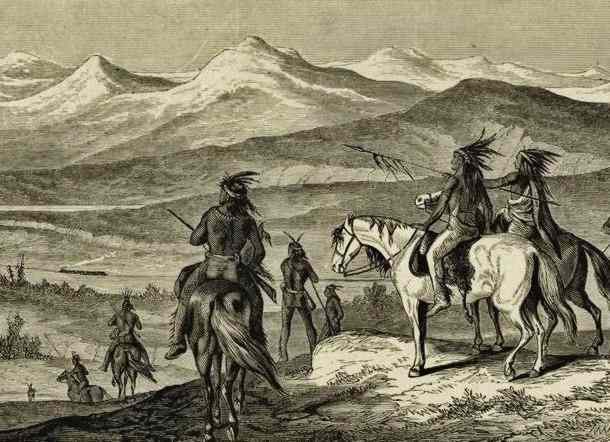 The Native Americans saw the railroad as a violation of their treaties with the United States. Some groups began to raid the labor camps along the line. Union Pacific responded by increasing security and by hiring marksmen to kill bison (commonly known as American buffalo) which were both a physical threat to trains and the primary food source for the Plains Indians. The pointed wedge of iron bars at the front of early train engines was called a "cow catcher". It served the same purpose for bison, lifting and pushing the errant beast to the side, preventing derailment of the train but usually killing the animal. As tourists began streaming west, some amused themselves during the long journey by shooting bison from the windows of their rail cars. Most killing of bison, though, was for the fine leather of their skins, useful both for clothing and as belts for industrial machines. The rail line gave the hunters convenient access to markets, and soon there was a widening gap in the bison herd as the hunt progressed outward from the rails. Estimates put the population of bison at the beginning of the 19th century at 30 to 100 million over all of North America. By the mid 1880's the population was down to a few hundred animals. From this tiny remnant a few conservationists were able, over time, to restore the species to stability. 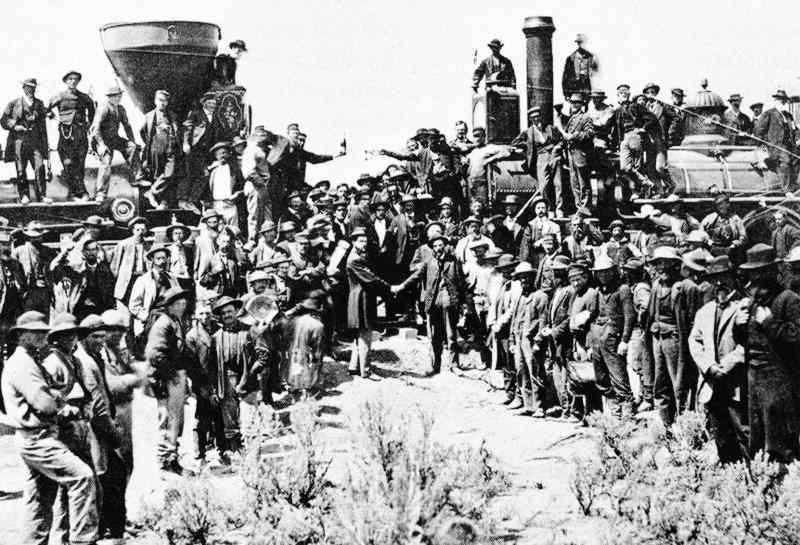 Six years after work began, laborers of the Central Pacific Railroad from the west and the Union Pacific Railroad from the east met at Promontory Summit, Utah. It was here on May 10, 1869 that Governor Stanford drove the Golden Spike (or the Last Spike), that symbolized the completion of the transcontinental railroad. Few were aware that the spike was merely gold plated, gold being much too soft for the purpose, and probably not billable. In perhaps the world's first live mass-media event, the hammer and spike were wired to the telegraph line so that each hammer stroke would be heard as a click at telegraph stations nationwide. Technical problems occurred, so clicks were actually sent by the telegraph operator, which makes this, most likely, the world's first fake mass media event. Indeed, there were four spikes driven that afternoon. A message was then transmitted over the new telegraph lines that read: "DONE." Those spikes, along with the special polished California Laurel tie, were replaced with ordinary ones as soon as the celebrities went off to their gala parties. There was great celebration around the country, travel time from coast to coast had been reduced from six months to one week. of the Golden Spike ceremony, despite having done half the work. Such were the times. but the white guys got to play with the locomotives. Photo by Andrew Russell, 1869. Despite the publicity for the "last spike", the American rail network did not yet actually run to either coast. In August 1870 the final connection was made. The journey was not cheap - the fare from Omaha to San Francisco in a third class sleeping car was about $65. On June 4, 1876 a train named the Transcontinental Express arrived in San Francisco 83 hours and 39 minutes after it left New York City. The Union Pacific RR was in bankruptcy less than three years after the completion of the line as details surfaced about overcharges by Credit Mobilier for the building of the railroad. The scandal was one of the biggest of the 19th century. Promontory Summit was bypassed by a shorter route in 1904, the rails there were pulled up in 1942 and recycled for the war effort. This began with a ceremonial "undriving" at the Golden Spike location. Today hundreds of miles of the historic TCRR line are still in service, especially through the Sierra Nevada Mountains and canyons in Utah and Wyoming. While the original rails and ties have long since been replaced, and the roadbed has been upgraded and repaired, the lines generally run on top of the original grade. Vista points on Interstate 80 through California's Truckee Canyon provide a panoramic view of many miles of the original Central Pacific grade. In many areas where the original line has been bypassed and abandoned, primarily in Utah, the former route is still obvious. Amtrak runs the California Zephyr rail service using the original Transcontinental Railroad route from Sacramento to Winnemucca, Nevada. The Zephyr often uses the original route on the westbound runs from Winnemucca to Wells, Nevada. The eastbound runs between these towns usually use more recent tracks. Today the rail line moves through a far different countryside. Wheat fields fill the plains instead of bison, condos have replaced the Indian Tipi. But people still ride the train to visit their family and children still wave as the train passes by. In another hundred years they probably still will. Information extensively revised and edited from Wikipedia and other sources. 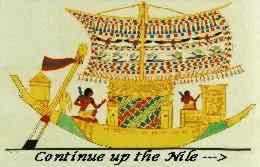 Many of the greatest mysteries of history concern Egypt. How did this ancient culture build pyramids larger and more precise than we could build today? What did they understand that we are missing? If this website got you thinking then you will appreciate AscendingPassage.com. It's free and much quieter than the train.